The HTC One max is a gigantic 5.9-inch phone with the signature HTC One touches - an aluminum back cover, UltraPixel camera and two large front-facing stereo speakers. 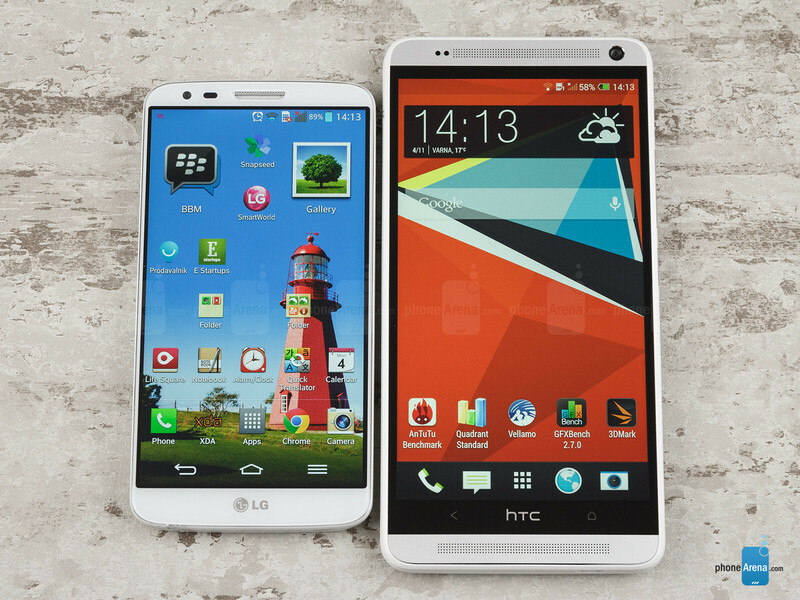 Big and beautiful, we now compare it against another device that is also relatively new, but very different - the LG G2. LG’s flagship is outfitted with a fairly large 5.2-inch display, but in a much more compact body than that is made out of polycarbonate. LG has experimented with design by putting the physical controls on the back of the G2 while the HTC One max - apart from its huge size - is a more traditionally designed phone. LG also brings a 13-megapixel optical image stabilized camera as opposed to the 4-megapixel shooter on the One max. 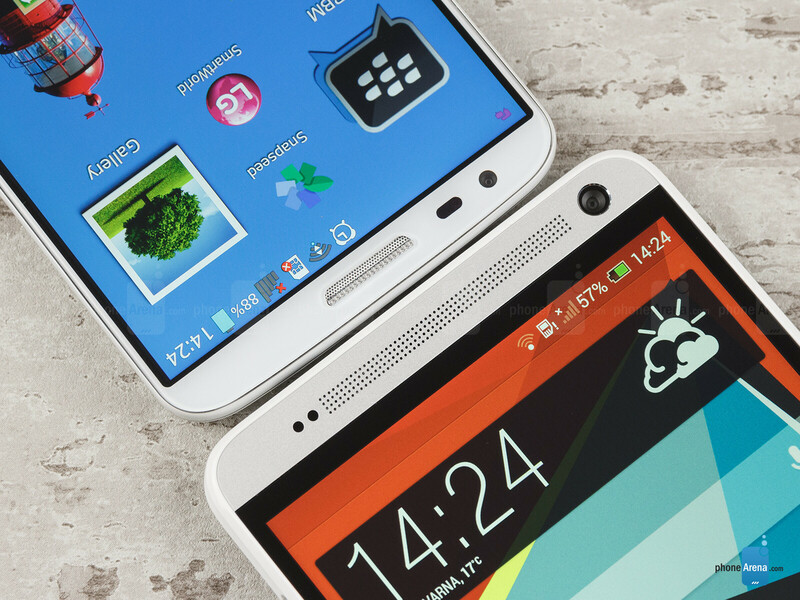 All in all, both the HTC One max and the LG G2 are top-shelf devices that will be fighting for your attention during the Holidays and later, so it’s time to carefully examine which one is worth your hard earned dollar. 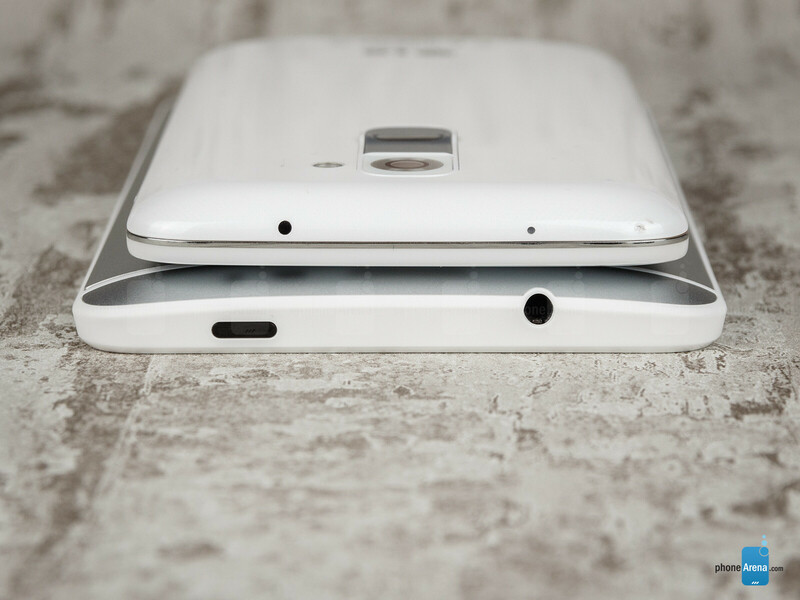 If smartphones had sizes, the HTC One max would carry not the XL, but the XXL mark. It is larger than the average phablet (truth be told, it’s not the largest, that title belongs to the Sony Xperia Z Ultra) and this is a double-edged sword. There is the apparent benefit of a larger screen, but there are some considerable handling difficulties and single-handed use is severely obstructed. 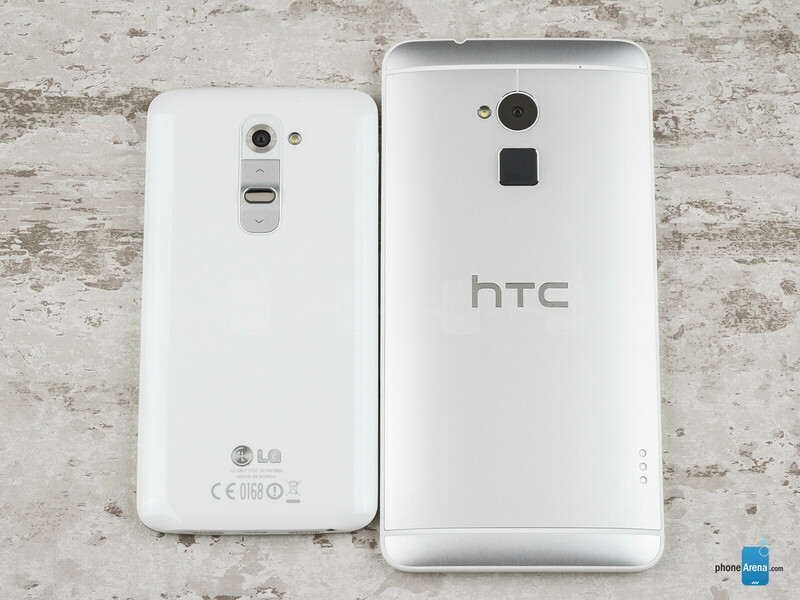 The LG G2 on its own is not a small device by any means, but looks midget-small when put next to the HTC One max that effectively dwarves it. Still, the difference in actual screen size is not that big as it would seem just by looking at the dimensions: there is a 5.2” display on the G2 and a 5.9” one on the One max. The stark size difference comes from the fact that the One max has much wider bezel whereas the G2 trims bezel to an absolute minimum on the sides. Now, that we’ve got the size element out of the way, it’s worth pointing out that the HTC One max features a sturdy and durable aluminum body that just feels solid. 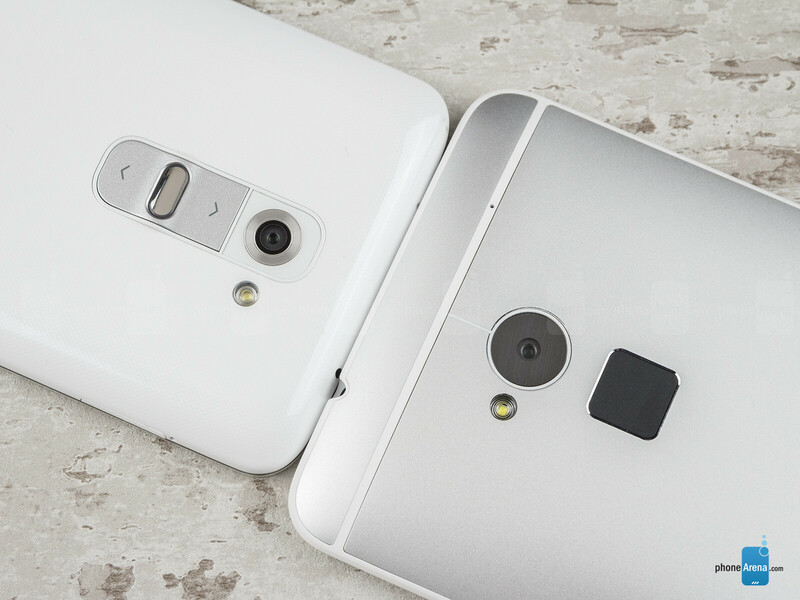 The LG G2 in contrast is made out of polycarbonate and does not feel solidly put together. Quite the contrary, squeeze it just a bit and it starts screaking and just giving way to pressure. The glossy polycarbonate shell also smudges much easier and your phone quickly starts to look like a mess whereas the aluminum body of the one looks clean even after longer use. The two devices also use different buttons for navigation. The One max features two capacitive keys (back and home key) below the screen, whereas the G2 comes with Android on-screen navigational keys. In terms of physical buttons, HTC obviously realizes how big the One max is and has moved all its physical keys (the lock button and volume rocker) on its right side, within easy reach. These metal buttons are solid yet reassuringly clicky. 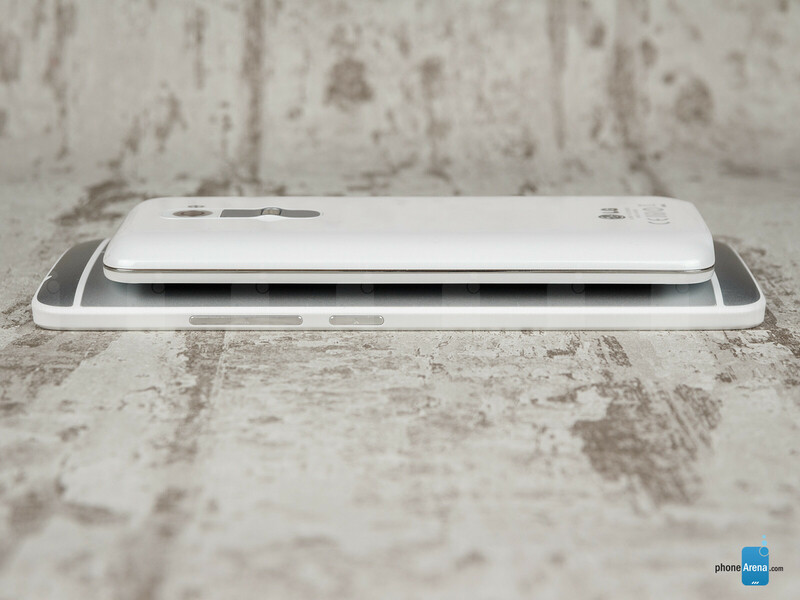 The LG G2 in contrast might confuse you at first as it has no physical buttons on its sides. LG has moved the lock and volume keys on the back of the device which in our experience is a convenient location. It’s a pity that the buttons themselves are wobbly, but still that does not make them hard to press. The HTC One max also has one feature no other Android phone has - a fingerprint reader located right below the camera on its back. Its rear-facing location is somewhat similar to the positioning of the G2 buttons, but the fingerprint scanner is much less pronounced and feels like a gimmick rather than a real feature. The reason for that is that it’s right below the camera and it’s hard to find, plus instead of a simple tap it requires a swipe to unlock the device. The HTC One max truly maximizes screen sizes bringing it to a tablet nearing 5.9 inches. The LG G2 features a smaller, 5.2-inch display and with on-screen buttons the actually usable space for most apps is even less. Both screens feature LCD technology, but with slight differences – the One max features a Super LCD 3 panel whereas it's IPS LCD on the G2. Both come with the same high resolution of 1080 x 1920 pixels. The larger screen on the One max means it has a slightly lower pixel density, but in reality the difference is imperceptible to the human eye in regular conditions, and both screens look stunningly sharp. The similarities however pretty much end up here since the displays are very different in the way they show colors and images. The One max’s screen is impressive not just for its size, but also for its mostly pleasing colors (with slight yellowish tint) and excellent contrast. The LG G2 display in contrast puts out colder than usual, blueish tones that look unnatural. That distorted color balance would not be a huge issue for the regular user, but for those of you who care about photography and videography, it would be at least an annoyance. Otherwise, both screens can get fairly bright and are usable outdoors even under direct sunlight, but we’ve seen better. Reflections get in the way particularly on the larger HTC One max screen and this mars the outdoor viewing experience. In terms of viewing angles, both are very good, but at more extreme angles some distortion in colors is noticeable. I'm getting tired of all theses versus'.... What's the purpose of this? It was obvious G2 beats the hell out of One max. There's never a winner at the end. Titles should be comparison. I have the Max and my wife has the G2. We both actually agree that the Max is superior in every way except the camera. G2 with it's beautiful screen and amazing camera. Clearly a winner in my book. Yes, I upgraded my one to One max.. G2 pro or Note 3 is clearly !! no match of One max.. clearly!!!! in every way !! no matter how you look at it. I got my LG G2 and I love it. Don't see any blueish color in that beautiful screen . The G2 the best phone I ever had. I always had Samsung and I'm not sure if I'd ever go back if LG continues strongly like this year. No blue tint and the battery last 2 full days easily. It drains very slow and charges unbelievably fast. No doubt, G2 for sure! Both phones are incredibly fast max bigger screen amd better sound g2 still big screen and way faster cant compare s600 to s800 i love my g2 great battery does everything in no time. I do love the zoe on the one phones wish it was added to more phones or the app sold for it the g2 has stuff you can edit out of pics if it pops up. I have LG G2. The pics with the back camera have good detail and contrast BUT always pick up reddish tones that are not there and oversaturate other colors too. My hair is died blond and the cam always puts reddish tones where that I don't see in the mirror or with iphone 5s. The phone screen is indeed bluish - when I took a pic of blue-gray sky, the pic looked VIOLET on the phone but closer to blue-gray when I saw it on the computer.